(NaturalNews) "Will vaccinate my baby for food!" That seems to be the goal of a program launched last year by the UnitedHealthcare health insurance company of Michigan. It has resorted to enticing parents with junk food to convince them to inject their infants with potentially deadly vaccines containing brain-damaging chemicals. This has been revealed in a letter acquired by NaturalNews and signed by Stephanie Esters, a vaccine-pushing RN who works for UnitedHealthcare. 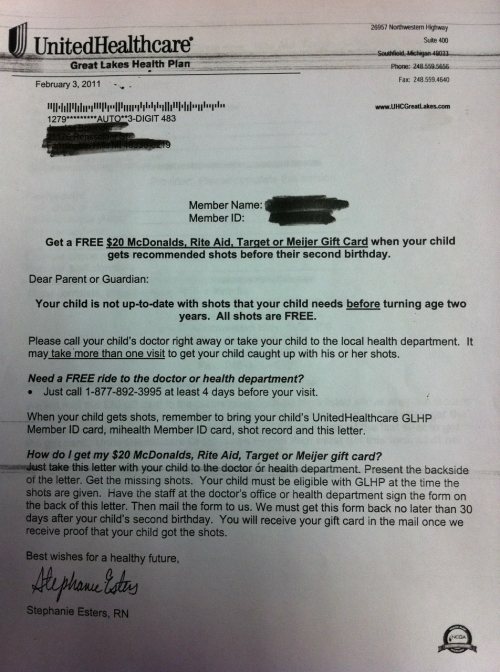 The letter declares "Get a FREE $20 McDonalds, Rite Aid, Target or Meijer Gift Card when your child gets recommended shots before their second birthday." It even goes on to offer a "FREE ride to the doctor" for those who are so poor that they don't own cars. Childhood vaccines, of course, are loaded with extremely toxic chemical adjuvants -- chemicals designed to cause neurological inflammation in order to invoke an immunological reaction. Vaccines also contain both mercury and aluminum, both of which are highly toxic brain poisons. This is why many children who are injected with such vaccines become autistic virtually overnight (their brains are poisoned beyond their biological threshold). While the fundamental science of inoculation is debatable, the adding of neuro-toxic chemicals to today's vaccines -- which are then injected into children in huge numbers (over 100 vaccines given to a typical child) -- turns them into chemical weapons being used to medically assault innocent children. Marrying this chemical weapons program with a junk food incentive program is the height of medical stupidity. It makes about as much sense as eating fried chicken to cure breast cancer (http://www.naturalnews.com/028631_Komen_for_the_cure_pinkwashing.html). Such a program obviously targets lower-income families which tend to be predominantly black or Latino, according to national statistics. The RN behind this nauseating vaccinate-for-food campaign is Stephanie Esters, an African American woman, demonstrating the black-on-black medical violence being committed against African American children in America every day. Rewarding vaccines with toxic junk food? Perhaps the most outrageous part of this entire eugenics scheme which may have already killed an unknown number of little black babies is that the reward for being injected with neurologically-damaging chemical vaccines is a gift certificate for disease-promoting "dead" junk food. It's clearly an encouragement for parents to feed their babies obesity-inducing junk food that will also promote diabetes (rampant among blacks), prostate cancer (super deadly among black men) and breast cancer (a huge money-maker for the criminal cancer industry which preys upon black women). Wash it down with a cocktail of phosphoric acid and aspartame -- also known as a "diet soda" -- and then give yourself even more cancer and heart disease with some fries! This is what United Healthcare encourages its customers to do? Are they so stupid that they do not realize such eating habits will increase the health-related claims against their own company? Obviously, if UnitedHealthcare actually wanted to improve the health of low-income children in Michigan, they would reward them with a bottle of nutritional supplements or superfoods. Give the kid some organic CocoChia bars from Living Fuel! Or buy some Boku Superfood for the family! The most disturbing trend in vaccine marketing today is that grocery stores and pharmacies are now resorting to marketing gimmicks and giveaways to entice parents into injecting their children with potentially deadly vaccines. This is all part of the vaccine eugenics agenda, of course, which specifically targets minorities and low-income families. Obviously a well-to-do family isn't going to be enticed by $20 worth of McDonald's junk food, but a poorly-informed mother living paycheck to paycheck -- just barely scraping by on government assistance programs -- may be more than willing to trade the health of her child for a $20 meal at McDonald's. Especially if all the nurses and doctors assure her that vaccines are good for her children... and vaccines never cause autism, she will be told. The whole point of vaccines is, of course, to depopulate the planet through infertility side effects or direct mortality of those receiving the vaccines. This has been openly and unambiguously admitted by the No. 1 financial contributor to vaccine research around the world -- Mr. Bill Gates. In an open, public speech recorded on video, Mr. Gates explains that vaccines can help reduce world population. Here's another thing everybody needs to know about children and vaccines: The healthiest children you'll ever meet are the ones whose parents refuse to vaccinated them. Nearly all the sick kids are the very same ones who have been injected multiple times, poked and prodded by pediatricians, and whose parents follow "conventional" medical advice about avoiding vitamins and putting their children on medication. These are the sniveling, sneezing kids who are plagued by allergies and autoimmune disorders. They're the kids who get diagnosed with brain tumors at age 9, or who end up with type-2 diabetes in their twenties. The toxic load of all the vaccines and medications -- combined with the total lack of real nutrition and mineralization -- puts these kids on track to be total medical police state slaves for the rest of their lives. And that's the way the medical police state wants it, of course: Everybody sickened, helpless, victimized and lacking even the cognitive awareness to know what's happening to them. Today's vaccine rewards programs promote this outcome by pushing both toxic vaccines and disease-promoting junk foods at the same time: "Here, poison your babies and win a free meal!" It's sickening. Get a FREE $20 McDonalds, Rite Aid, Target or Meijer Gift Card when your child gets recommended shots before their second birthday. Your child is not up-to-date with shots that your child needs BEFORE turning age two years. All shots are FREE. Please call your child's doctor right away or take your child to the local health department. It may take more than one visit to get your child caught up with his or her shots. Need a FREE ride to the doctor or health department? Just call 1-977-892-3995 at least 4 days before your visit. When your child gets shots, remember to bring your child's UnitedHealthcare GLHP Member ID card, mihealth Member ID card, shot record and this letter. How do I get my $20 McDonald's, Rite Aid, Target or Meijer gift card? Just take this letter with your child to the doctor or health department. Present the backside of the letter. Get the missing shots. Your child must be eligible with GLHP at the time the shots are given. 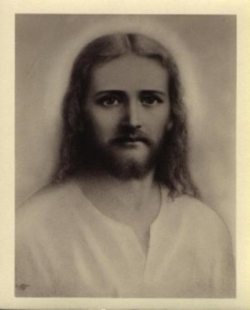 Have the staff at the doctor's office or health department sign the form on the back of this letter. Then mail the form to us. We must get this form back no later than 30 days after your child's second birthday. You will receive your gift card in the mail once we receive proof that your child got the shots. Stephanie Esters, by the way, can be reached at sesters@uhc.com or 248-331-4369. Esters is also involved in a child blood screening program. In a canned YouTube video that is obviously scripted word-for-word (so fake! ), she insists they are taking childrens' blood for "lead screening" (http://www.youtube.com/watch?v=apZhylyJEjo). LEAD SCREENING: United-Healthcare Great Lakes quality outreach staff will call you when your child needs to get his or her second lead screening. ...Have the form signed and send it back to us. We will send you a Target or Mcdonald's gift card. Your child's name will also be entered in a monthly drawing for a $150 MasterCard gift card. "POSTPARTUM CARE: If you have your postpartum visit on time, you can get another Target gift card. Your name will also be entered in a monthly drawing for a $150 MasterCard gift card. Call your OB doctor's office right after you deliver your baby." It is in these follow-up visits, of course, that vaccines are aggressively pushed by medical staff. Across the nation, women who refuse to vaccinate their children may have both the police and Child Protective Services called to intervene and threaten to steal away their children (http://www.naturalnews.com/034684_pediatricians_child_protective_services...).